D-CON No View No Touch Covered Mouse Trap is a safe than conventional and traditional mouse traps & it is more easier to use than traditional rat traps. All you need to do is just bait, twist and set the trap. This discreet covered trap conceals the dead mouse 100% so you will not see or touch a dead mouse even in disposing. The No View, No Touch mice trap is completely safe to use around children & pets. The disposal of dead rodent is very simple, Once a mouse is caught, just dispose of the entire trap. One of the most effective mouse traps in getting rid of mice and rats without touching or seeing them. Place this trap where high intensity of mouse activity is seen rest will be taken care by this DCon Mouse Trap. Ideal for: kitchen, bathroom, bedroom, pantry, and living room. Discreet covered trap that conceals the dead mouse 100%. Safer than traditional mouse traps & much easier to use – just bait, twist and set! No messy cleanup. Just dispose of the entire trap. Ideal for: kitchens, bathrooms, bedrooms, pantry, and living rooms. How does the D Con mouse trap work? The below are the directions to use. On the bottom of the trap, peel back the small self-adhesive label. Apply cheese or peanut butter as bait in the compartment. Reseal the self-sticky label over compartment, and turn mice trap against the label. Don’t over bait the trap for better result. The recommended bait amount is approximately a pea-sized.We are placing the mouse bait to lure the rats and mice into trap not to feed them. For baiting the trap, you can use either peanut butter, chocolate or cheese whichever is frequently used. Hold the base of trap and twist the top cover in clockwise rotation (as per the direction of arrow) until it gets locked. Once it is locked, A red indicator will be seen through the hole marked as “Set” on the top of the trap. Once this is done, A mouse entryway will open in front. Gently place the set D Con trap on hard surface near walls, cracks or in areas where mice are active. To get better results, It is recommended to place two or more d-CON traps at 4-6 feet apart from where you see or suspect mice activities. When mouse gets in and trapped, the entryway of D Con trap is closed. The red indicator shows through the hole marked “Mouse Caught”. Simply Dispose of the entire trap. Note: If trap is accidentally triggered, No worries – a red indicator will show at the “Not Set” position. Repeat the instructions at Step 2 (“Setting”) if this occurs. How to use d-con Trap? Place the set trap on areas where mice and rat activities are seen highly. Usually around the hard surface near wall, cracks and dark areas. If rodents are not caught in 3-5 days, move traps to a new location. To achieve best results, we recommend you to use two or more d-CON Ultra Set Covered Mouse Traps by placing them 4 to 6 feet apart from the suspected mice activity areas. Once a mouse is caught, discard the entire trap. Never touch or see rodents with these effective mouse traps. How do you set a D Con mouse trap? While holding base of trap in a horizontal position, twist top cover in a clockwise rotation (follow the direction of arrow until it locks properly). A red indicator will show through the hole marked “Set” on top of the trap. A mouse entry way will open in front. How long does it take for decon to kill a mouse? When baited with recommend pea size baits and placed in the right location where mice activities are high. It starts killing mice overnight. But it is recommended to place the trap in same location for at least 3-5 days to effectively kill the rats. Since rats and mice are suspicious and will not enter into the trap in the first instance. Can I Reuse D-Con Trap? No, This is a disposable trap. It is not meant to be reused. It would be difficult and messy to extract a dead mouse from the trap. Can I use baits other than cheese or peanut butter? Yes, You can use any other bait. But the most recommended is peanut butter which helps in luring the rats and mice into the trap. What are the other D-Con Traps available? No View, No Touch™ traps. Where to Buy d-Con Traps? D-CON traps are available at all online eCommerce store. Our preferred choice is through amazon.com since they are the pioneer in eCommerce industry that takes care of priority delivering and word class customer service. Buy d-Con Mouse Trap from Amazon. D Con No View, No Touch™ is a unique, award-winning mouse trap which delivers on “no see, no touch” promise with effective and efficient killing performance.If you use d-con, you will never see a dead mouse again! This is a disposal trap which helps to dispose the dead rodents without touching or seeing them. 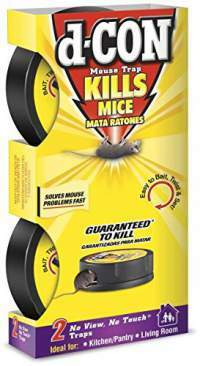 Overall, It works aggressively for smaller sized rats and mice but stands behind in killing bigger sized rodents. The D-Con is the ultimate “no touch” kill trap for those who are not comfortable in handling dead mice.